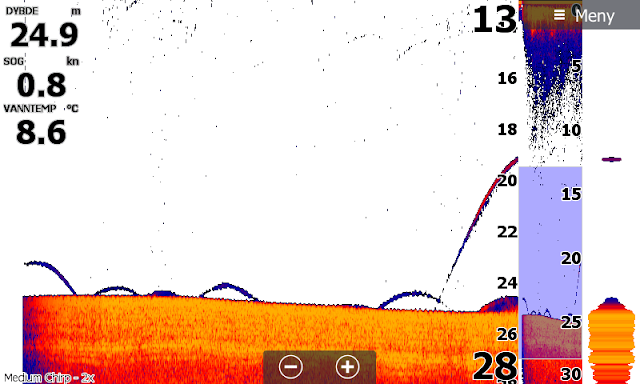 Team Colibri: What is the difference between Lowrance HDS and Elite Ti? What is the difference between Lowrance HDS and Elite Ti? Elite Ti offers some serious value for money. But what is it that sets it apart from HDS? And do you really need all the HDS-tech? This article is not ment to be a complete walk-through, but focusses on the technical differences between Elite Ti and HDS Gen 3, while trying to explain why those technical differences might mather when in your boat fishing. But before we look at the details, let us do a quick recap of the Elite-history. The name Elite has been used by Lowrance for quite some time, as their midle-range models. Before Elite Ti we had Elite CHIRP, before that Elite HDI and before that Elite/ Elite DSI and so on. All the Elite-models before Elite Ti have been offered as models with both sonar and chartplotter, pure sonar (with the letter x, like Elite 4x) and pure chartplotter (with the letter m, like Elite 7m). Elite Ti is however only available with both sonar and chartplotter. You can still use it without a transeducer connected as a chartplotter, or as just sonar without a mapchip in it. 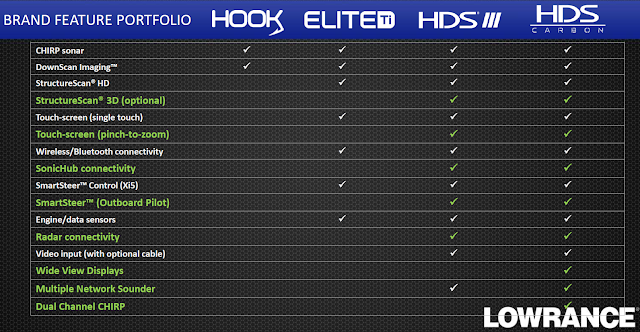 Elite HDI was the first Elite drawing heavily on the HDS-series, it had almost the same sonar buildt in as HDS Gen 1. Generally speaking, the last few generations of Elites have had a lot of tech from the previous HDS-generation, but with less options for networking. Elite Ti follows that trend. It contains a lot of the tech seen in HDS Gen 2 Touch and HDS Gen 3, but with limited networking. I will therefore compare it with both HDS Gen 2 Touch and HDS Gen 3, but mainly with Gen 3. Elite Ti comes in 5,7,9 and 12 while HDS Gen 2 Touch and Gen 3 comes in 7,9 and 12. The numbers referr to actual screensize apart for the 12 which is actually 12,1". Keep in mind that all these are widescreen-like. Ie the with of the screen is larger then the hight of the screen.This a good thing when using SideScan (scanning sonar that looks to the sides of the boat) and when using splittscreen (ie 2D-sonar and chartplotter or DownScan/ chart and 2D-sonar etc at the same time). It is not such a good thing when looking at functions where the height of the screen is important, ie 2D-sonar, DownScan or chartplotter. The resolution of the screen is the same for Elite Ti and HDS Gen 2 Touch and HDS Gen 3. But the screen on Elite Ti is the same as HDS Gen 2 Touch. Ie single-touch, one finger at the time, as opposed to multi-touch on HDS Gen 3. The screen itself is LCD of the TFT-type with plastic glued to plastic, while HDS Gen 3 has glas glued to plastic making the screen look sligthly "sharper". Like HDS Gen 2 Touch, but different from HDS Gen 3, Elite Ti only has a few buttons and many operations has to be done by touch. Elite Tis 2D sonar is very good. At the point of writing this, it is however not compatible with Airmars chirp-transeducers like HDS Gen 3. The upper screenshot shows medium chirp from the TotalScan-transeducer on my Elite 7 Ti. The lower screenshot shows medium chirp on my HDS 5 Gen 2 from a Sonarhub-module and Airmar TM150M. 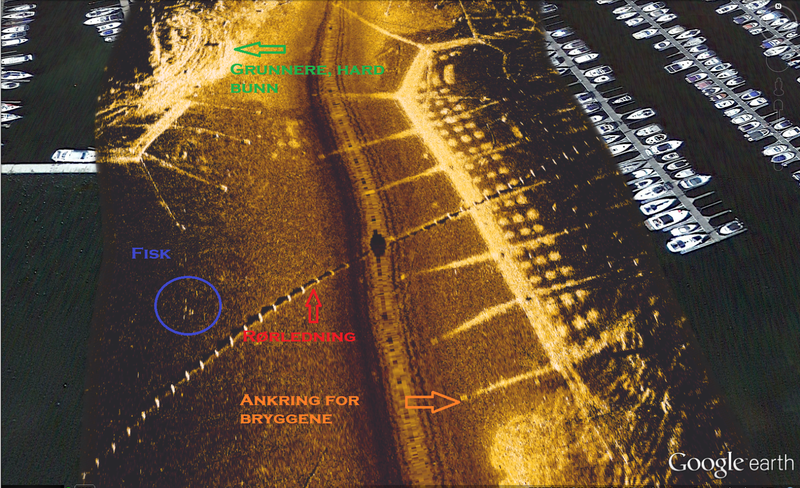 Both images look good, clear and with well defined arches showing fish. But the depth (in meters) is different. TotalScans 2D-element is at its best in depths of 1-40 meters. In deeper water Lowrance has its 50/200/455/800-HDI ducer. It is at its best in 1-80 meters of water, and is very similar to Airmar P66 in 2D-quality. (I actually preferr 50/200/455/800-HDI over P66 on Lowrance) The HDI-ducer gives you DownScan in adition to 2D, but it does not have SideScan. When comparing the Elite Ti to its main rival, Garmin EchoMap, the lack of a "all in one"-ducer for deep water is the Elites main flaw. (On the other hand the Elite is better then EchoMap on map-compability and NMEA2000.) For more information on Lowrance own ducer-alternatives, see THIS artickle. By using the transeducer called TotalScan, you get both DownScan and SideScan in adition to 2D. Since Elite Ti has only one port for connecting your transeducer, this is the only option for both 2D and StructureScan on Elite Ti. HDS has two ports, enabling you to use one transeducer (LSS-2) for StructureScan and another transeducer for 2D. TotalScan is compatible with both Elite Ti and HDS Gen 3, but NOT with HDS Gen 2 Touch. This might sound like a detail, but it is one of the major differences between Elite Ti and HDS. As with most "all in one"-ducers, TotalScan is long, heavy and expencive. On fast boats, like bassboats, it can be difficult to mount and adjust the TotalScan so that it works well both when idling and while on plane. The upper screenshot shows SideScan from Elite Ti/ TotalScan, while the lower is from a sonarlog recorded using StructureScan 3D on HDS and then overlaid on Google Earth. 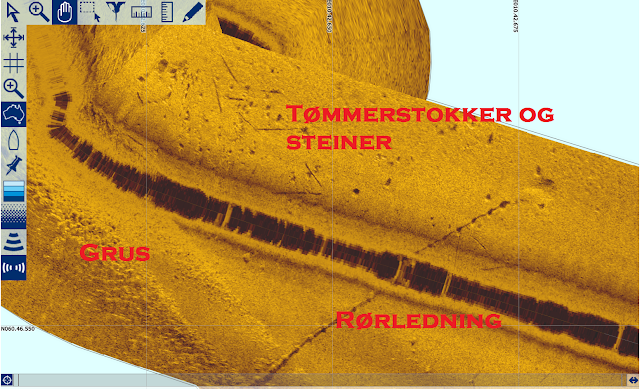 StructureScan 3D is only available for HDS, and shows impressive range in adition to a 3D-view. StructureScan 3D is only available for HDS. Elite Ti has almost the same chartplotteralternatives as HDS Gen 3, both for settings and the type of maps you can use. Navionics, C-map, Insight Genesis, Reefmaster and a lot of other smal 3.-party maps can be used. Elite Ti does not support all the functions in Navionics Platinum like HDS does. The GPS updates at 10 Hz, fast enough, and from 7 and upwards Elite Ti is compatible with Point-1 through NMEA2000 supporting its electronic compass. HDS offcourse supports NMEA2000 as well, so only Elite 5 Ti differs. BUT Elite Ti does not support radar/ radar-overlay, since it does not support the ethernet needed for radar. 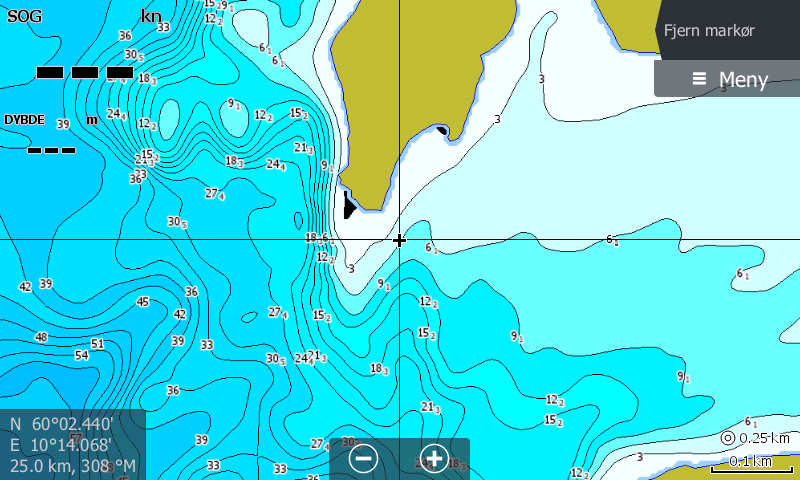 Both Elite Ti and HDS Gen 3 supports Navionics Sonarcharts Live, ie live-mapping drawn up on your chartplotter as you go. Both need a softwareupdate for this to work, free softwareupdates can be found HERE. Since both Elite Ti and HDS Gen 3 has WIFI with NMEA-data in the WIFI-feed, both can be used for live mapping on mobile/ tablet using the Navionics Boating-app as well, completely free. This is where the most noticable difference is. Elite Ti does not support ethernet, the form of network that enables sonar and charts to be shared between units and radar as well as StructureScan 3D. Elite Ti from 7 and up supports NMEA2000, so they can share waypoints as long as both units are turned on. But HDS with ethernet takes it one more step and syncronies waypoints between units with ethernet. So if you change a waypoint on one screen, like changing the symbol or moving it a copule of feet, the other screens shows the change. This is a major plus when you have a lot of waypoints and saves you quite a bit of "tidying up"-time. With the latest software HDS Gen 3 not only networks sonar so you can see another HDS and it ducer, it also lets you see two sources of 2D-sonar at one HDS at the same time in splitt-screen. (Multiple network sounder) So you can sit at the consolle, looking at the HDS there, and view 2D from both the stern-mounted ducer and the ducer in/ on your trolling motor up front. (And the other way around.) Now imagine yourself standing up front by the TM and fising vertically on a fish you see on 2D. That fish moves out of the coneangle on your HDS up front, but since you also see of the back, you can see if it went that way and follow it. The NMEA2000-network in Elite Ti has a few limitations. From the list above you can see that it does not support outboard-autopilot and Sonichub. By late 2017 a Y-cable has become available for Elite Ti, and with that Y-cable the LSS-2 (StructureScan-ducer) and any OEM Lowrance-ducer for 2D can be used with Elite Ti. A typical example would be using LSS-2 and HST-WSBL (transom mount) or LSS-2 and PD-WBL (shoot through). Jeg trodde at dette er transducer som er for sval, men det er ekkoloden, ser ut sånn. 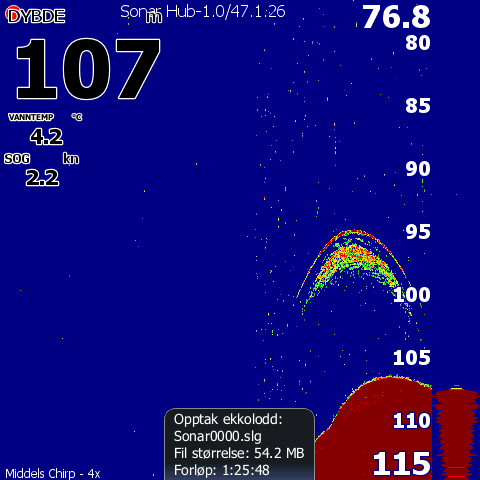 Men lowrance sa at 2d sonar i elite(hook) og HDS er likt. Jeg skal prøve tipsen din. Jeg prøvde bruke medium chirp før, men det var mye støy på skjermen, så jeg bruker mest høy chirp. Elite ti7 har bedre 2d sonar? Er den helt likt som i HDS?